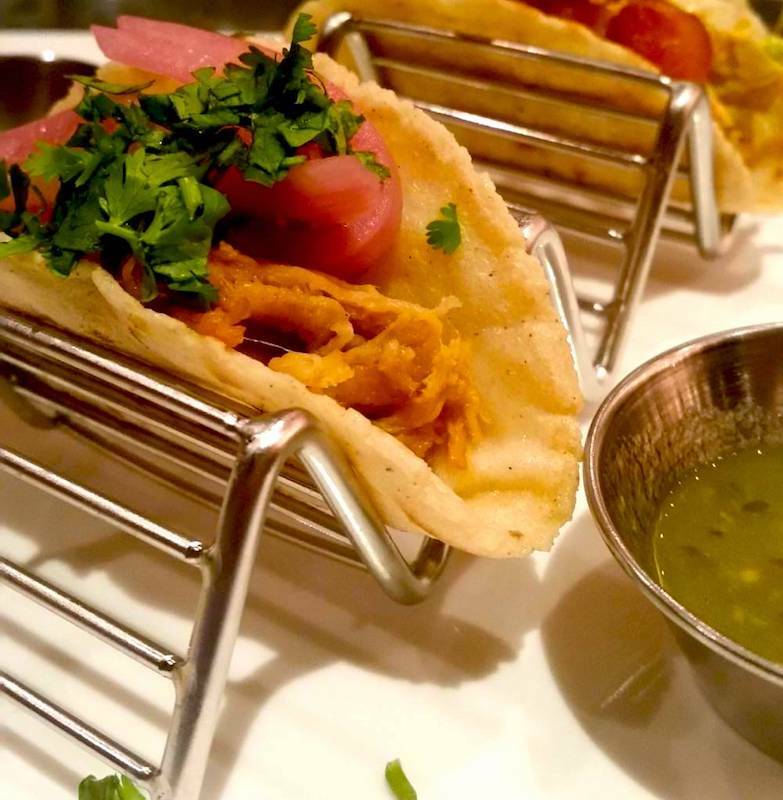 Ed note: With new Mexican restaurants opening in our area, Petworth News contributing writer Yuliya Panfil wanted to see which tacqueria had the best tacos. She went to three different restaurants and files this unscientific but hopefully helpful review! Last month, newly minted Taqueria del Barrio on Upshur Street joined Taqueria Habanero and Mezcalero Cocina Mexicano on 14th Street to form a sort of Petworth "taco trifecta" of taquerias. Three trendy taco joints, all opened recently or in the last few years, at all around the same price point, within half a mile of each other. When you want a taco, what's a hungry resident to do? Clearly, this called for a taco taste test, and your faithful Petworth News blogger was up for the challenge (the struggle is real). I’ll start by saying that in this taco contest, there are no winners. If you’re looking for more high-end, knock em’ dead food in the ‘hood, head to Himitsu, Ruta del Vino, Little Coco's or any of the amazing restaurants in our neighborhood. That said, if you’re craving Mexican cuisine, these joints have you covered. Overall, I liked Taqueria Habanero’s food the best, particularly for the price point; however, the service was actively bad. Taqueria del Barrio was in the middle: solid food, particularly the seafood tacos, but you get less for your money and service is middling. Mezcalero came in last, with bland tacos and not much ambiance. Feel free to agree, dispute or all-out trash my taco tastes in the comments area at the bottom. Taqueria Habanero (3710 14th St NW) is one of two dueling taquerias lining the block of 14th Street between Quincy Street and Spring Road. It’s run by Mexican immigrants who earned their culinary stripes cooking for José Andrés. Habanero prides itself on cooking recipes from Puebla, a city not far from Mexico City that is famous for its delicious cuisine. Yelp reviews gave it a solid 4.5 stars. I was excited to check out this spot. No taco evaluation would be complete without my good friend and food expert, Mariana. Mariana used to work for José Andrés and she’s also fluent in Spanish. That makes her infinitely more qualified than I to both pronounce the ingredients on a taqueria menu and to judge the quality of the tacos. So, on a brisk Wednesday evening, Mariana and I cozied into one of Habanero’s sidewalk tables. Outdoor seating is always a plus in my book – the evening was off to an auspicious start. The tacos were priced between $2.50 (for meat) and $3 (for seafood). Even better! I ordered the Camaron (shrimp) taco, and the Al Pastor (slow roasted pork with pineapple). Mariana also ordered the Al Pastor, as well as the Lengua (tongue). We received a plate of chips and salsa that was unremarkable. We picked at it as we caught up and waited for our tacos. Tacos are supposed to be simple: a corn tortilla, a few chunks of filling, and a dusting of veggies/garnishes. But here we were, 30 minutes later, with nary a taco in sight. After finally getting our waitress’ attention, we inquired about the tacos. “They should be right out,” she assured us, and hurried to the kitchen. Another 10 minutes later, our four small tacos appeared. “Sorry, there was a … mix-up … in the kitchen,” she offered. OK, so clearly our waitress forgot to put in our order, and walking by our empty table over the course of 40 minutes failed to jog her memory. That’s fine. But at least comp us a taco, no? Anyway, on to the "meat" of the review (see what I did there?). My tacos were good. Like, really solid and enjoyable. Not West Coast good, and not "let me bring you to this secret spot that serves the best tacos in town" good, but thoroughly satisfying, hearty and flavorful. I particularly enjoyed my shrimp taco, served with a tangy cream sauce that perfectly complimented the grilled shrimp, and a generous slice of avocado on top. Mariana, a more discerning critic, praised the Al Pastor, but disdained the Lengua, deeming it chewy and lacking flavor. And so with that, we were ready to pay up and head next door to taqueria #2 for the night. But it was not to be. As darkness settled over 14th Street, and the temperature dropped below 50, our waitress was nowhere in sight. Attempts to flag down other staff failed. Mariana put on her coat; I had come from a workout and had no coat to put on, so I shivered in my tank top. After approximately 15 minutes of me flailing my arms, NYC-taxi-hailing-style, we finally managed to flag down our waitress, who had been hiding indoors. “Ugh, it's so cold out here,” she complained as she came over to us. My plate was cleared; Mariana’s wasn’t. Our bill was eventually brought, and we paid it. “I think this is a place where people come mostly to hang out and drink, and the tacos are a solid, filling, enjoyable sideshow,” Mariana concluded. My review was a bit more forgiving: I quite liked both of my tacos, and would come back here. Our bill for four tacos was about $11, which is awesome. But the service really ruined it for me. The fact that our waitress was egregiously bad is one thing, but the fact that we couldn’t flag down any of the other wait staff makes me think the issue might be a bit more systemic. Conclusion: Come for the tacos, not for the service. *Postscript: I returned to Taqueria Habanero that weekend with my husband. We really enjoyed the food (particularly the Huarache), however my waiter spilled a ramekin of salsa and a cup of water on me (all in the same incident, not separate mishaps) and to add insult to injury, never gave me new water or new salsa! So, my review remains: Good food, crappy service. Mezcalero Cocina Mexicano (3714 14th St. NW) is a hot new Mexican joint that opened in January 2017 on 14th Street, two doors down from Habanero. The restaurant entrance is emblazoned with an agave plant, and a giant rooster stands proudly in front of the entrance. From the name alone, you can deduce that this is not a taco joint, but rather a bar with generous food offerings. The proprietors – who also own El Sol Restaurant y Taqueria in Mount Vernon Square advertise Mezcalero as bringing "the authentic flavors of their native Mexico City" to the neighborhood. These "taco trials" were not my first visit to Mezcalero. In fact, I had come with a co-worker when it just opened. The drinks were supposed to be stellar, so I ordered a margarita. It was sweet and watered down. (Then again, I don’t really like margaritas, so maybe that one was on me.) I also ordered the Carne Asada, to go. My husband and I ate it out of a styrofoam box in my kitchen 45 minutes later, which isn’t the most flattering way to eat a steak, so I won’t pass judgment. All in all, it was a forgettable experience back then. Fast forward a few months, and I was back, with Mariana in tow. I ordered the tilapia taco and the campechano, which had an interesting combination of chorizo, steak, caramelized onion, cilantro and shoestring potatoes. Mariana also ordered the tilapia taco, and the Al Pastor. Early signs were promising: a waitress brought tortilla chips to our table, along with three delicious salsas. The salsas tasted house-made, and had that smoky kick that reminds you of veggies crackling over a campsite grill. Then the tacos came, and that’s where the trouble started. 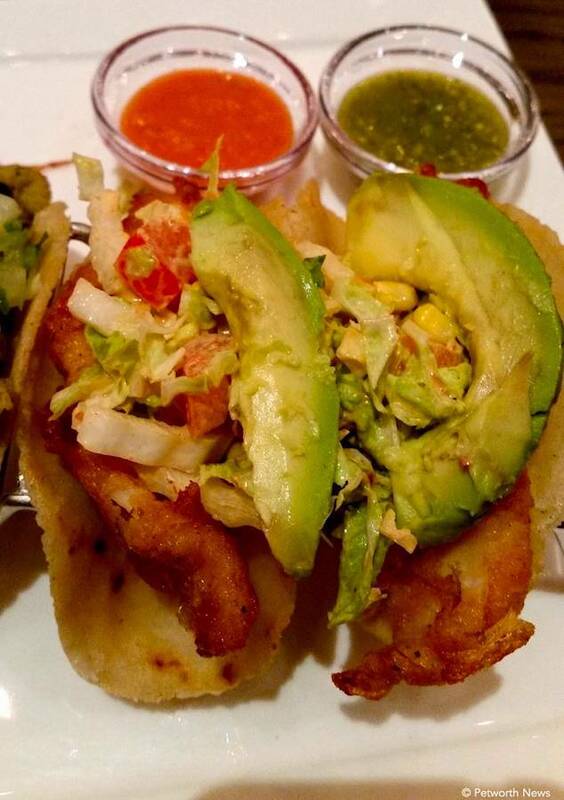 Specifically, it was the tilapia taco, which is described as "blackened," with a side of slaw. What we received was a corn tortilla adorned with a rectangular piece of (unblackened) fish that had been bisected with a piece of avocado. On top was a piece of yellow sauce, or perhaps it was cheese. “It kind of has a…. sawdust flavor,” Mariana mused, as she chewed her bite. Meanwhile, I was busy triaging mine with the (still great) salsa. In the end, I put so much salsa on my jailhouse tilapia that I do not feel qualified to opine on its character. The Al Pastor and the Campechano fared better. The Pastor had a nice char on it, with plump, juicy pineapples (not from a can!). The potato strings on the Campechano were a nice, creative surprise, adding some crunch to the saucy chorizo/steak mix. But in the end, the Pastor and Campechano were just OK, and the tilapia was actively disappointing. What I will say is that the service was prompt, and the prices – between $2.50 and $3 per taco – were on point. Conclusion: Maybe stick with the mezcal? This is the Taqueria that started the taco challenge for me. Taqueria del Barrio (821 Upshur St NW) is near and dear to my heart – literally– as it’s located on the burgeoning Upshur Street drag, two blocks from my house. It’s a stylish restaurant/bar, blending authentic Mexican cooking with modern takes on Latin dishes. My husband and I were lucky enough to score a seat at one of the restaurant’s preview nights. The place was packed and the atmosphere was buzzy with 20-somethings mingling at a tiled bar in the back, and giddy patrons settling into turquoise-colored benches up front, craning their necks to check out the murals adorning the eatery’s brick walls. Everyone loves a new neighborhood restaurant, and del Barrio certainly looked the part. The food was free that night, and we sampled… a lot of it. I will concentrate my review on the tacos, though I do want to give a shout out to the flaky, juicy empanadas (the best thing I had), and the fragrant, ridiculously addictive alfajores. We ordered the fish taco and the Barbacoa (slow cooked, shredded beef). The kitchen forgot our order, and we had to put it in again, but it was a preview night after all, so I didn’t hold it against them. The fish was fresh and delicious, coated in a crispy beer batter and finished with tangy napa slaw and creamy avocado. The barbacoa was juicy and well cooked, topped with a simple onion/tomato mix. But the best part perhaps was the actual tortilla; freshly made and firm, holding the taco without being overly dense. We left our meal fully satisfied, and full to the point of being almost comatose. But I wondered, was our review colored by the fact that the food was free? So I returned. "Taqueria Take Two" was a bit of an accident. I had skillfully locked myself out of the house, and posted up at del Barrio to pass the time before my husband came home. I sat at the bar, shamelessly eavesdropping on a double date (spoiler alert: couple #1 met on a cruise – he was competing in a hairy man contest, and she was judging). This time, I ordered my tacos judiciously, savoring them one by one. Service was again slow, but I didn’t really mind. I was certainly in no hurry, and as the booze flowed the cruise couple became steadily more entertaining. I had the Camarones, the Carnitas (crispy, slow cooked pork), and the El Pastor. The Camarones were once again the best: real talk, the beer batter Del Barrio uses on the fish is on point. The Carnitas were juicy, but had no char or crisp on them. I have nothing in my notebook for the Al Pastor, which means that it was unremarkable. This time, however, I picked up on something that had eluded me on the preview night: now that I was paying per taco, I noticed how skimpy each taco seemed. The size of the tortillas was the same as at Mezcalero and Habanero, but the filling consisted only of the protein, with a bit of sprinkled cilantro, onion or some other veggie on top. Want avocado? Extra $1. Cheese? Extra 75 cents. At roughly $1 per bite, I found myself questioning the value proposition. Conclusion: Come for the vibe, stay for the food, and know your meal might set you back more than the other taquerias (per bite). What do you think of these restaurants? Chime in below in the comments section.